Maria Donata DiIorio first appears in the Painesville, Ohio, area in 1921. In America, Maria Donata DiIorio was known by her married name, Mary Malizio. Maria Donata DiIorio, daughter of Filippo DiIorio and Felicia Vitolone, was born on September 28, 1898, at Frosolone, Italy. She married Palmerino Malizia, son of Vincenzo Malizia and Candida Collaiti, in 1922. Maria died on March 11, 1965 at Lake County Memorial Hospital at Painesville, Lake County, Ohio, at age 66. Her body was interred at Saint Mary Catholic Cemetery at Painesville Township, Lake County, Ohio. Maria Donata DiIorio, age 23, immigrated to the United States on December 6, 1921, travelling to Painesville, Lake County, Ohio. She was joining her brother, Domenico Nicola DiIorio, in Painesville. Three of Maria Donata DiIorio’s sisblings also lived in Painesville. Her sister, Maria Giuseppa DiIorio immigrated to Painesville in 1904. Her brother Nicola lived in Painesville from 1908. Her brother Feliceantonio DiIorio immigrated in 1921. Mrs. Malizio’s mother, Maria Filomena Vitolone, was a first cousin the Painesville Square family’s mother, Maria Giovanna Vitolone. 1. Michael Malizio was born about 1924, at Ohio. He married Gloria Pizzino, daughter of Vincenzo Pizzino and Maria Loria. 2. Inez Malizio was born in 1925, at Ohio. She married Clarence W. Lindsco, son of Arthur and Laura Lindsco, about 1945. Inez died in 1993. Her body was interred at Riverside Cemetery at Painesville, Lake County, Ohio. 3. 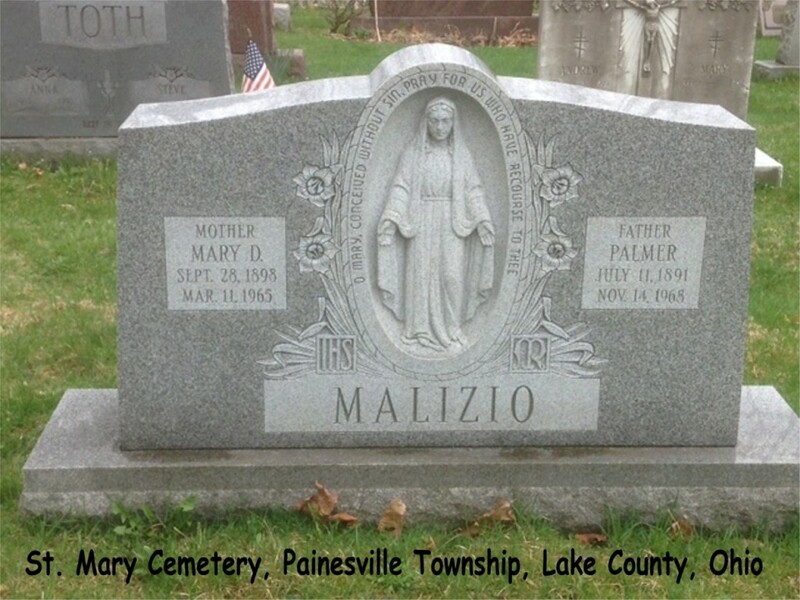 Elda Mary Malizio was born on October 12, 1926, at Painesville, Lake County, Ohio. She married Carl G. Eggert. Elda Mary died on January 15, 2006, at Clear Lake Regional Hospital, Houston, Harris County, Texas, at age 79. Her body was interred at Houston, Harris County, Texas. 4. Hilda Malizio was born about 1927, at Ohio. 5. William Malizio was born on September 28, 1930, at Painesville, Lake County, Ohio. William died on September 18, 1976, at age 45. His body was interred at St. Mary Cemetery at Painesville Township, Lake County, Ohio.